I love my stroller. It is just perfect for when I get tired or Annie wants to walk farther than I do. When Bunnybell visits, she sort of uses my stroller like an Uber. When she doesn't feel like walking anymore, she asks to ride with me. I wonder if this is a potential business. I could start with all the small dogs in my neighborhood. Hmmm. This could be big. I can name it Rosy Rueber. What a great idea, Rosy! Rosy Rueber! 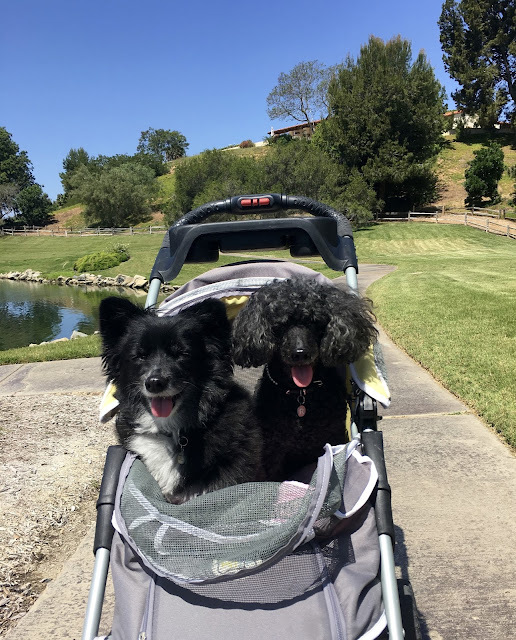 You could have a team of dogs with strollers ready to roll at all the trails nearby. I bet you'd be so busy you wouldn't be able to keep up! Exactly ! I could start interviewing dogs with strollers. Not sure what role Annie could play yet. BearHUGs & RosyPoodleKisses. Yes! Not sure what the ducks and swans would think about my fleet! BearHUGs & RosyPoodleKisses!